[Michael Chen] liked the sound he was getting out of these Corsair SP2200 computer speakers, with one big exception. They were giving off some unpleasant crackling sounds. He figured this might be as easy as replacing a faulty potentiometer, but soon found out the fix was going to be more complicated than that. All said and done he ended up reworking the design of the speakers’ amplifier board. The hardest part was identifying the problem. Once he had cracked open the case he found the volume potentiometer was working correctly by testing it with a multimeter. Next he inspected the board for bad solder joints but didn’t really find any. The breakthrough came when he realized that the crackling was also happening when he used headphones. With that discovery he started making a few more observations and realized that the crackling didn’t happen when the volume knob was all the way up or all the way down. There was an impedance issue between that potentiometer and the amplifier circuit. He rerouted the signal flow on the board to use the headphone amp as a filter and it fixed the problem. Fittingly, he’s entered this project into the Instructables Fix & Improve contest. While I agree that Corsair customer support is usually quite good, a nice hack like this beats dealing with RMAs and international shipping any day. because why else would he use the headphone signal as a “filtered” signal? edit: i think the original article is where the typo is, so HAD was actually doing the proper thing by referring to the article. Actually, it WAS reflected on the headphone signal. When I did some reverse engineering, I found that the headphone amplifier was fed after the potentiometer, and everything else before it was ok. The noise was being introduced further down the line and traveled back. Since I removed the 0 ohm resistors, noise could no longer reflect back and the headphone amp made a nice buffer. ohh, very perplexing, initially i’d say it was (the usual) capacitor going bad but this sounds different, they all have the LEFT go bad but not right? hmm maybe its NOT capacitor, weird, thanks for the writeup! PS: was this amplifier a class-D amplifier? that would explain it and the failure would be in the design of the board emitting the (class-D) RF into the input, possibly could be fixed (in the design) by relocating input wires away from speaker connections. I didn’t do much reverse engineering of the amplifier, as the volume control board was much smaller and easier to decipher. However, it did seem like a class D due to the presence of inductors. If I had to guess the problem, due to the high impedance after the filter (greater than 50k, unless the volume knob is at zero, case in which it is shorted to ground), noise gets easily introduced into the wire that goes from the subwoofer to the right speaker for volume control. The cable was shielded cable, so any noise introduced had to come from the subwoofer amplifier or the contact. By some slight difference, maybe noise is more likely to appear on the left input than on the right. Nice fix, but I’d just return them and buy a better set of speakers. There’s alot of reviews on the SP2200 that say they crackle. Nice! 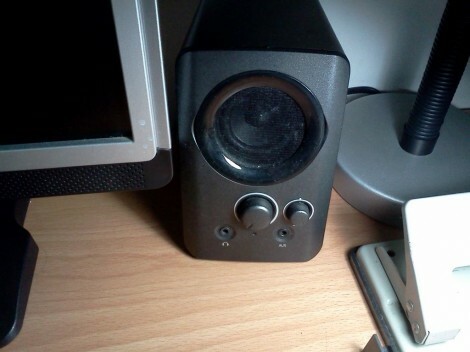 I got these speakers on massive discount presumably because they’re discontinued due to the poor design. I haven’t had issue, but if they start to crackle I’ll do this. Good on him for figuring it out! Just remember to lower the volume on software or reduce the amplifier gain by changing feedback resistors. Dunno what value to use, though. Solder a fine wire to each of the four pads on the set of 0-ohm resistor so that you can clip leads to something, bring the box into the circuit (doesn’t have to be a full-out decade box if you don’t want it to be… work in increments of 5s/50s/etc… instead of 1s/10s/etc… (or whatever increment suits your fancy). Just make sure that you measure and use the best possible resistor values for each position). Then ‘scope the audio output until you get the desired amp output relative to the computer audio output (use audacity to play back tone files at a known level and set your computer audio software levels to a zero gain level). Nah, I decided to cheat and lower the volume on software mostly because I haven’t found many local stores in Panama that cell smd resistors (or any smd piece), most sell through hole only (that I am aware of). A 741 op amp won’t put any power audio, just gain. Unless educational or esoteric, don’t waste time building an amp. Just recycle any of decades of good design laying about. Get a real amplifier, real speakers, and real audio (no mpee’s). The output of a sound card should drive headphones cleanly. If crap amps in tiny speakers foul this up, send them to the recycle bin. Don’t matter if new. Always run any digital volume control at max, you are getting all 16 bits from source to the 16 bit soundcard to the linear world. Run VLC player at 100% not higher. When set at less you are getting less than the resolution of the source, and then turning up the low res stuff with analogue gain. We can hear SEVEN orders of magnitude, pots can do that 16 bits can’t. Or, you know, you could do whatever you please as long as you’re okay with how it sounds. I know, but these speakers were my brothers. He isn’t audiophile (or even cares); he just wanted them to sound. Consider this an upgrade from the cheapest speakers you can find, those crappy genius speakers. If it was for someone more knowledgeable, or that could distinguish those missing bits of resolution, I would have searched a bit more for the resistor values that set the correct gain. Dude, just yesturday I opened up my new speakers because they had exactly the same problem! Different speakers, but I guess that’s what you get when you pay $1.50 for speakers. When I opened it up it only consisted of one op amp, 4 caps, a few jumpers and a pot… the board was about the same size as the one in the video, but it was mostly unused. Needless to say I was hella salty, but now I think I might replace some jumpers with resistors and see what happens. Nice Instructable! btw, I know it’s been said by other readers before, but it always feels like when I have a new electronics-related problem, HaD comes out with the perfect article the next day… weird!!! No no no, your problem is different. First, is it crackling or clipping (which are different). Second, don’t go around replacing random resistors; you are going to break the speakers. I did some reverse engineering to determine what was wrong. One the cheaper speakers, I’d check the knob and the solder; if its the knob, it’s going to crackle when you change the volume. If it is a solder, it will probably be visible. Of course my problem is different, we have very different speakers obviously. I’m going to do some probing before I do anything, I was just trying to say the work you did in your Instructable might save me some time. I’m not just “replacing random resistors,” I’m an EE, not some random hobyist blindly following your instructions.